Crafted of lightweight aluminum tube with an aluminum fretboard, backed with wood. 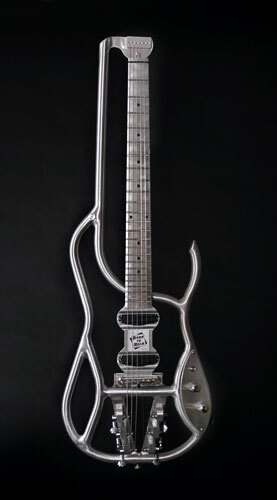 Weighs less than a standard guitar. Resonant overtones ideal for driving today's powerful signal processors. Feels like you're playing strings a gauge lighter! Use 10's and get the feel of 9's, with improved tone. Fits a standard gig bag. Produces incredible attack and overtones impossible to achieve with a wood-body guitar, because wood absorbs sound. Run it through an overdrive and get the sound you have been looking for, at any volume level.